Rejecting former Army Chief General V K Singh's denial about claiming payment of cash to ruling politicians in the state, the Jammu and Kashmir legislative council has summon the general to appear in person before its privilege committee on January 9, 2014. This was decided in a meeting of the privilege committee held in winter capital Jammu under the chairmanship of Jugal Kishore Sharma and comprising MLCs Devender Singh Rana, Ravinder Kumar Sharma, Ghulam Nabi Monga, Ali Mohammad Dar and Showkat Hussain Ganai. 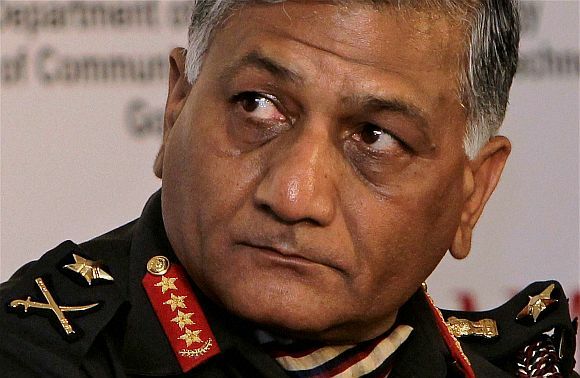 General Singh had created a stir earlier this year when he told a news channel that ministers and legislators in Jammu and Kashmir had been beneficiaries of Army's secret funds. Last month, General Singh had sent a reply to the notice sent to him by the speaker of the Jammu and Kashmir assembly to explain his position on alleged payoff allegations to the state ministers made by him during an interview. Sources in Jammu said General Singh in his reply had vehemently denied the charges and claimed that his comments had not been taken in right perspective. The privilege motion against former army chief was moved by MLCs Ajay Sadhotra, Devender Singh Rana and Khalid Najeeb Suhrawardy in the last session of the council taking cognizance of his utterances. The other privilege motions moved by the legislators were also discussed in the meeting.